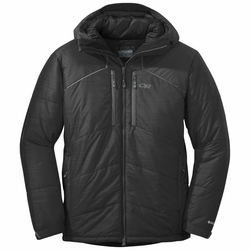 Outdoor Research Perch Belay Parka. Ice climbers know a thing or two about staying warm in all those long, stationary stretches when their partner is leading a pitch. Outdoor Research made the Perch Belay Parka for them (and for anyone who wants water-resistant warmth while, say, grilling burgers in a ski resort parking lot in February). A Pertex® Endurance shell pumped full of down-like PrimaLoft® Gold, designed to fit over all your other layers. It also stuffs into the big interior pocket in the back so it can clip to your harness while you lead the next pitch—or be used as a pillow.